110 years ago today occurred one of the state’s worst train disasters. 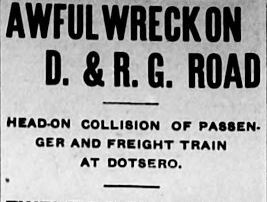 On January 15, 1909 at 9:47p.m., a westbound Denver & Rio Grande passenger train collided with an eastbound freight train just outside of Dotsero, in Eagle County. Apparently the engineer of the passenger train had been confused about the time his train was ordered to depart. Twenty people, mostly passengers, were killed instantly in the head-on collision; another five succumbed to their injuries within a week of the accident. Thirty others were also injured. The Dotsero disaster, along with several smaller wrecks and derailments occurring that same year, caused the Colorado Railroad Commission to examine railroad safety laws and pursue legislation for increased railroad safety. You can read their report and recommendations online, courtesy of our library. This report includes some unfortunate statistics – in all of the 1909 accidents combined, thirty-five passengers lost their lives and seventy-six were injured. That’s not even counting railroad employees or individuals who were trespassing on railroad tracks. If those numbers are taken into account, a total of 113 persons were killed that year, and 116 injured. You can read more about the state’s investigation of the Dotsero wreck in the Biennial Report of the State Railroad Commission, another publication which as been digitized by our library. The state Railroad Commission eventually became the Public Utilities Commission, which still exists today, overseeing rail and transit safety alongside other utilities such as energy and telecommunications. Annual/biennial reports of both commissions from 1907 through 1930, as well as more recent reports, can be viewed online from our library. Finally, be sure to search the Colorado Historic Newspapers Collection for some fascinating digitized newspaper articles about the Dotsero disaster.